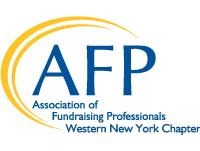 The AFP Western New York Chapter is made stronger every day by our leadership and the committees that support our programming and growth. Active and effective committees boost the value and quality of membership for all chapter members. We encourage and welcome any current chapter members that would like to join a chapter committee. Interested in learning more or joining a committee? Drop us an email at afpwny@afpwnychapter.org. Download a copy of the Chapter Committees summary. Estimated time commitment varies throughout the year, with an average minimum of 1 meeting per month, plus 1-2 hours a month of email, research, and related work; some additional time when preparing for events. We are dedicated to making committee membership accessible for our chapter members throughout Western New York, so conference call-in options are available for all meetings. Overview: National Philanthropy Day is AFP’s annual celebration of the exceptional philanthropic efforts that change our community with a giving heart. Held every year around November 15th, the event draws nearly 500 fundraisers and representatives from local businesses and non-profits. The committee manages all aspects of logistics, day-of-event operations, invitations, securing sponsorships, production of the event program book, script, awards and event promotions. Overview: Committee drives member recruitment and retention, engages and welcomes members, provides information about member benefits, helps with prospect mailings, produces member-only events and recruitment events. Overview: Committee prepares and executes a plan for monthly professional development lunches and an annual conference. Develops new programs to meet the educational needs of chapter members and other potential attendees. Secures speakers, researches venues, promotes events, hosts/emcees events. Overview: Committee guides and executes efforts to promote, expand impact and presence of our chapter, AFP, philanthropy and fundraising profession. Effectively market chapter events to members and non-members, the media and the public through social and other media presence and engagement. Steers chapter newsletter, website and marketing materials. Busiest time: TBD, likely in the weeks before NPD and other major chapter events. Overview: The committee was established in 2018 in accordance with AFP International’s 2017-2019 Strategic Plan. During year one, our chapter President helped build the committee, and the committee began to assess all forms of diversity within our membership. Current work includes composing a comprehensive strategy and set of policies to develop a more diverse, inclusive, equitable, and accessible chapter. The proposal will go to our Chapter Board of Directors. The Board will then finalize and launch the strategy set forth by the committee. The committee will then work to ensure full implementation of the strategy and to assess and adjust related needs moving forward. Overview: Composed solely of current Chapter Board Members, this committee is responsible for annual review of all policies and procedures, and recommending revisions to the full board. The committee also engages in building a slate of potential new board members through work with committee chairs and in reviewing the membership list; makes a slate recommendation to the Board two months in advance of the annual meeting and elections in December.